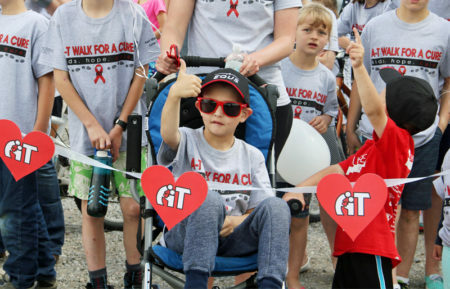 These 5K and/or family walks provide the funding needed to make critical A-T research happen. You can support your own A-T CureTeam efforts with an event in your area. Contact your school, youth group, or neighborhood friends to set a date and place. Tell the A-T Children’s Project how many t-shirts and sponsor brochures you will need, and we will easily custom design our t-shirts and brochures to suit your event and send them to you. Everybody shows up, walks around track, neighborhood, or park for half an hour or certain distance, and you collect the money and pass out t-shirts.